The one thing that stresses people out about traveling is packing. I eased my stress about packing by bringing everything with me. I was a chronic over-packer. And, if the situation ever came up where I had packed everything and I still had a little space left in my suitcase, I felt like I’d won the lottery. More space = more stuff. I’d run around looking for other things that would fill the empty space. I might need that stuff. You know … just in case. One time I went to Mexico for less than a week. I brought 5 pairs of shoes plus the ones I was wearing, and then wore flip-flops for the entire trip. What was I thinking? I love to travel and see the world. Living with less has inspired me to travel with less. Everything I pack fits into a small carry-on suitcase and tote bag or I don’t bring it. That goes for a trip that last several days or several weeks. 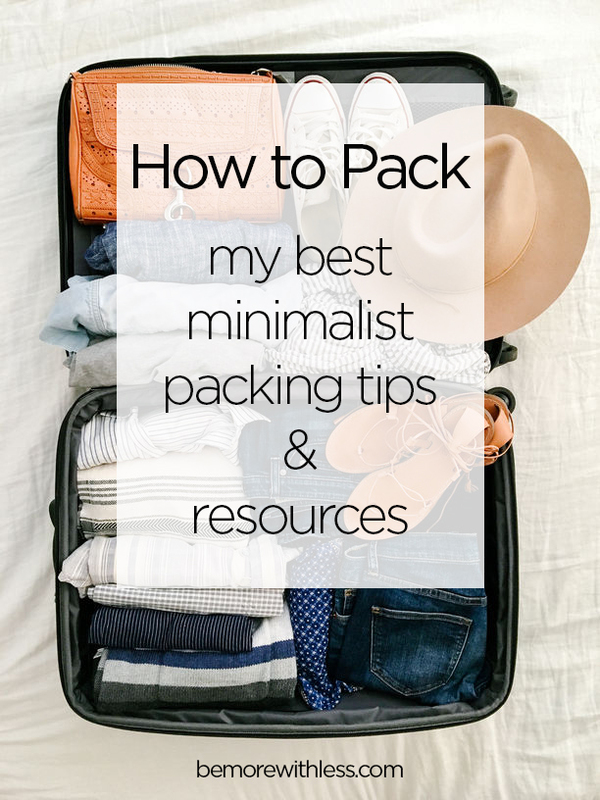 If you love to travel too and want to see the world with a little less baggage, I hope you’ll enjoy my best minimalist packing tips and resources. Pack for half of your trip. If you are going to be away for a week, ask yourself what you need for 3 or 4 days. Don’t be afraid to outfit-repeat. People barely notice what you wear in your day-to-day life. It’s unlikely anyone will notice or care while you travel. Create packing lists. Before your next trip, list everything you bring with you. Check each thing off when you use it. At the end of the trip you’ll know you can leave anything home that wasn’t crossed off on that type of trip. Keep your list handy with details about where you went and what time of year, and save so the next time you take a similar trip, you’ll know exactly what to pack. Understand your laundry opportunities. Will you be staying somewhere with a washing machine? I’ll rent an apartment from Airbnb specifically because it has a washing machine if I am staying somewhere for longer than 2-3 days. Some hotels have laundry rooms for guests. At the very least, you’ll likely have access to your bathroom sink where you can wash and line dry certain items. Know when to fold ’em. I’ve tried rolling, stacking and folding my clothes for packing and haven’t noticed a big space difference. In a recent article in Real Simple magazine, author Hitha Palepu says, “I roll my bottoms and fold my tops—I find my clothes end up with fewer wrinkles and I can fit more in my bag.” The only way to really know what works best for you is to experiment. I recommend rolling your clothes for the first leg of your trip and then folding or stacking them on the return trip. See which method you prefer. Create a travel day uniform. Assign one outfit for your travel day. Then you don’t have to think about what to wear on the plane, train or however you are traveling. No matter wear you are going, your travel uniform can be the same. I typically wear a black pair of leggings, short-sleeved shirt or tank, and black zip up sweatshirt with a scarf (on or in my tote bag). Even if I’m traveling to a warm destination, I know I’ll get cold on the plane. Remember … just in case means never. When you notice you are adding items to your suitcase just in case you might need it, stop. Ask yourself why. Will you really use it or (like I was) do you feel compelled to fill the empty space in your suitcase? Can you get it at your destination if you need it? What’s the worst thing that will happen if you don’t bring it? Don’t forget what matters. If all of your focus is on your stuff and what to pack, you may miss out on what really matters like connecting with people on your travels or enjoying new locations. More importantly, don’t forget about you. Take care of yourself while traveling. How to Pack: This book includes all things packing. From choosing the right carry-on bag to custom packing lists, How to Pack: Travel Smart for Any Trip is your go-to packing guide. Pakt One Bag: My friends Joshua and Ryan from The Minimalists are releasing the same bag they use and used in Minimalism, a Documentary about the Important Things. I’ve taken The Pakt One Bag on a couple of trips and am surprised that it holds as much as my hard-shell carry-on. See what I mean here (you may be surprised to find out what a minimalist actually packs too). 1. Everything must fit in 1 carry on plus my small backpack. 7. Don’t forget gifts for the people who will be hosting you. 8. Duct tape. It’s good for most types of repairs. I wrap a generous amount around a CD case so it doesn’t take much space. Personally I disagree with the carry-on bag that the videos showed because it doesn’t have wheels. I too have a bad back and lugging a carry on over my shoulder is a no no. (Hey, I’m 70!) I put a hook on the outside of my small wheeled carry-on so that I can also attach my small backpack when traipsing through airports or long walks. Most of the time when I travel, I have no opportunities to wash, so most of the time I will take an extra top in case I spill something on me – which tends to happen mostly when I did not take that extra top. I’m a minimalist packer when it comes to my own stuff, but I overpack for my toddler. I definitely do the “but she might need this…” when I’m packing for her. I also think because her clothing is so tiny, I can bring that much more of it! I’m much more minimal at home with her but notice it doesn’t carry over into travel. I feel like this might change as I get more comfortable traveling with her over time. Great tips Courtney! If you haven’t done so yet, give Woolite a try. It’s excellent for hand washing clothes and rinses out quickly and easily unlike detergents like Tide. With rare exceptions, I only take a single small backpack with me when I travel, regardless of whether I’m vacationing for a week or for a month. Getting rid of the “just in case” items is key. Truly, shoes are the bane of my travel-packing-existence. I’ll organize my clothes, only to realize that I HAVE to bring a pair of brown shoes (when I’ll be wearing black ones on the plane & with 90% of my outfits). The problem is that packing is so stressful for me that I’d rather throw in the brown pair of shoes rather than choose a different outfit. As I travel more, and collect more clothes I love rather than merely tolerate, I’m hoping to get past this packing hurdle. No one should have to bring an extra bag for shoes. I’d like to see the recording of the webinar! I wasn’t able to watch it live. I got the less is more bug in Venice, Italy. If nothing else will convince you Venice surely will! You walk or you boat. Period. God help you if you pack too much! I have gotten it down to just “standard” items that work on ANY trip: Worn clothes. Here is that standard “uniform”! Underwear Group A and B. One worn. A spare pair of pants. A spare long sleeve dress shirt. A long sleeve under shirt. A pair of tights for sleep and extra warmth. I layer everything for the really cold! Out of the bag and on me! One blazer. One worn pair of shoes. Who cares if you wear the same thing every day??? Basic “kits”: Laundry, Tech, Meds, Toilet, OTC And EDC. I have an Osprey 22 Ozone and a small messenger bag. Both are small enough to come on board with me! NO checked bag! Ever. I take “dry” versions of everything so I have NO 311 baggie! You can actually buy toiletries every where in Europe! You can go very far and stay out for a long time with very little. Thank you so much for this perfectly timed post! I’m starting to pack for 2 weeks in Australia. It’s winter there, so I was worried about how I was going to fit 2 weeks of winter bulk into a manageable amount of bags. Your post has empowered me to do that! And thank you for this blog. It has kept me inspired on my minimalist journey for several years now (I’ve lost count of how many 🙂 ). I appreciate you and your ideas so much! What about having Merino wool clothes? They are light weight and they don’t need to be washed often, they don’t stink such as cotton especially when it’s warm. So it helps for any minimalist packing! I usually fly with one carry-on size rolling suitcase (which I usually gate-check rather than hoist into the overhead), and a small backpack. Passport and money go into a RFID fanny pack for the flight; at my destination, I switch to a small cross-body purse. I always bring a big woolen scarf/shawl/poncho for the plane. For sunny destinations, Coolibar makes a fantastic silky oversized SPF 50 scarf that can double as a blanket, or even as a sarong/dress. While I enjoy browsing local markets, including grocery and department stores, I’ve found that U.S. brands of cosmetics and toiletries are often more expensive overseas, so I try to bring enough to last the trip. Rather than lugging along laundry soap or Woolite, I use shampoo or Dr. Bronner’s for washing out undies and socks. Other people may not notice if you’re repeating outfits, but they do notice if your clothes are dirty, worn-out, or just inappropriate. Old clothes may be great for camping, but you will fit in and be treated better if you make an effort to dress up when going out to dinner, etc. abroad.